HE OTHER DAY, I conceived of a theory (conclusion?) I wish to share. It was regarding the capacity of the modern Catholic to understand Liturgy. In particular, I asked myself whether we have reached a point of our “television culture” where everything is so informal and unstructured that any notion of dignified, proper Liturgical actions at Mass are lost. Perhaps the kind reader will allow me to explain. First of all, we never discuss politics on the CCW Blog, because talking politics is not our calling: it is not something we focus on. When it comes to politics, all we really feel called to share is that the life issues are paramount for us. In other words, we must always promote what Pope John Paul II called a “Culture of Life” and do what we can to stop the murder of the innocent. This is very important. In spite of this, I hope the reader will permit me to mention a small bit about politics, because it is impossible for me to make my point otherwise. I happened to see a section from one of the National Conventions on YouTube, where Cardinal Timothy Dolan was giving an important closing prayer for the convention. Hopefully my memory of the event is correct (my memory is not always reliable). To put it mildly, I was appalled. First of all, the Cardinal was introduced by the Speaker of the House, who seemed to me (without question) to be drunk. For myself, I don’t drink, so I’m not an expert in this area, but I really felt that he was severely intoxicated, which I find scandalous. Drinking to excess is a sin. Furthermore, the Cardinal was trying to start the prayer, but the lights, sound, and special effects wouldn’t let him. (* Note this point) He just stood there, patiently waiting, and looking really foolish as balloons were coming down from the ceiling. Finally, he got sick of waiting (I, frankly, would have simply walked off the stage) and started the prayer. Nobody payed attention. Eventually, some of them stopped what they were doing and paid attention. It was a mess. I wonder if the constant and relentless “television society” has contributed to this. Have you noticed that absolutely everything is shown on television these days? Even the most intimate and private things are shown. Bad and ugly behavior is shown. Childish actions are glorified. There are even numerous shows that are “reality shows” or take you “behind the scenes,” so you see your favorite actors doing things that make you lose respect for them. Whose idea was this? It seems to me that in the old days they had a better sense of what types of things ought to be shown . . . and how they should be presented. I have reached a point where I will not watch television in public anymore: I’m just too embarrassed for the human race. 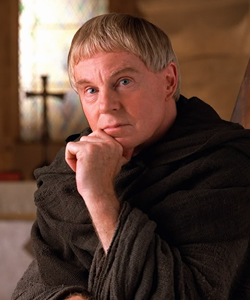 In private I will watch Brother Cadfael movies, early episodes of Andy Griffith, documentaries about famous musicians, or other well-produced things. (And, ever since we started having kids, I cannot even remember the last time I watched anything!). When people become accustomed to seeing sick, perverse, childish, ridiculous presented on the television screen, perhaps we should not be surprised that our liturgies are not dignified and reverent. Furthermore, showing intimate and special things on television really does “cheapen” life. I hope that Corpus Christi Watershed can always continue to “build up” the culture, and be a real force for what is true, good, holy, and beautiful.